Farmer and international English hops spokesperson Ali Capper at Stocks Farm in Suckley, Worcester. The Capper family has run Stocks Farm in Worcestershire, England, for more than 50 years. Mark Capper bought Stocks Farm way back in 1962, but today Mark’s son Richard Capper and his wife Ali run the business, which includes more than 100 acres of hops, 100 acres of apples and some 300,000 chickens reared annually. We recently got the opportunity to meet Ali Capper in Denver at the Craft Brewers Conference and BrewExpo America a few weeks ago. She’s a farmer’s daughter whose career in London spanned 15 years in marketing and advertising, which became pretty apparent as we interviewed her. She has now returned to her roots on the farm and works tirelessly to promote British hops. We asked Ali to give some insight into the British hop market, and she happily obliged with the quick Q&A below. CBB: Ali, thanks very much for taking time out of your busy CBC tradeshow schedule to talk to us. First off, maybe you can tell us a little bit about yourself. Capper: I’m married to a hop grower in the U.K., and we grow 100 acres of hops and that puts us in the top five as far as hop growers in the U.K. We’re very small by American standards, but the average size of a hop farm in the U.K. is about 30 to 50 acres, so 100 is quite significant. We grow nine different hop varieties. We grow tall and also grow the low trellis varieties, which are those dwarfed varieties. CBB: Is there a certain British hop variety that’s seeing a lot of interest today? Are there some cool, new varieties attracting American craft brewers specifically? Capper: Fuggle and Golding — they are very much in play right now — and they are actually quintessential, historic and amazing British hops. But I think the ones that the market here [in America] is going to be excited about are varieties like Pilgrim, Phoenix, Jester — Jester’s got lovely, wild American aromas — and Admiral, which has a lovely, dark, orangey, aroma hop. Oh, and the other one that is working really well in this market is First Gold, and that’s one of our low trellis varieties. It’s orangey and marmalade-y, but it’s got a lower alpha level than Admiral, so it doesn’t have that same big hit. Admiral is sort of the IPA-type hop, where First Gold is more of your session beer-type hop. CBB: Tell us about British hops in general. What are their pros and cons compared to the rest of the hop growing world, and how does that famous British weather affect hop farming? British hops are definitely different. They’re unique, and they’re unique because of where we grow them. Our climate is a maritime climate, which means we have warm, but not hot summers and cool, but not cold winters. It means an even precipitation throughout the year, although we had a lot of rain this winter. What we have is a dull maritime climate. New Zealand has a maritime climate. Tasmania has a maritime climate, but they have far less precipitation and they have far less cloud cover. So what that delivers in a British hop is a lower myrcene level, and I can send you the data on this, but English hop varieties that are grown in the U.K. and then compared to the U.S. and New Zealand varieties have a significant difference in the myrcene level. Myrcene is an indicator for monoterpene — and monoterpene is about aroma intensity. That’s what makes British hops delicate. Because the myrcene level is lower that means there is more room for all the other hop components in the flower, which makes a British hop more complex. And that’s what delivers that drinkable, complex, rounded flavor out of our hop varieties. We do have some hops with some high notes — hops like Target — where they’ve got reasonably high alpha levels and punch above their weight, but most British hops are in a delicate flavor range and that makes them perfect for pale ales, really good drinkable seasonable ales and of course stouts. CBB: How can American craft brewers go about finding English-grown hops? And how much do they cost compared to hops grown around the world? British hops are very competitive. As with varieties grown elsewhere, price does depend on popularity of the hop. The best source of information for British hop aromas and oils is the website www.britishhops.org.uk, which provides all the analytical information about British hop varieties. It also introduces the hop merchants who sell British hops. All the major merchants have access to British hops although some will carry more varieties than others and some will carry more stock than others. I’m here to support Charles Faram Ltd. which carry a lot of British hops in stock and now have an office in Portland to supply the U.S. craft brewers. CBB: Besides great hops, what should a craft brewer expect from their hop breeders and hop farmers overall? 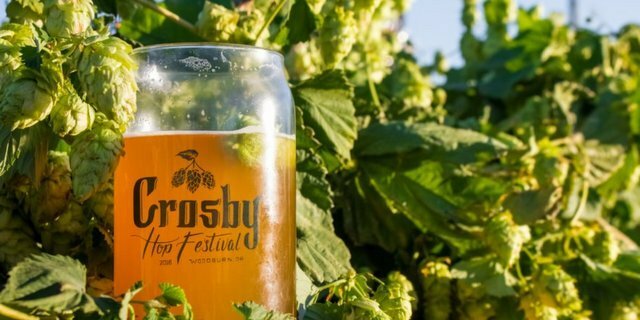 When it comes to things like unique varieties, sustainable farming practices or hop contracts, what advice can you share to ensure a satisfied relationship for hop supplier and brewery? What is Stocks Farm’s philosophy when it comes to maintaining those types of high business standards? Farmers want what their customer needs from a breeding program, so from a hop breeder a craft brewer should expect beautiful hops that are good for pest and disease resistance, high yields and creativity of new aromas and flavors. As far as farmers go, craft brewers should expect a loyal, hard-working partnership. Hop farming is a long-term business. When a grower makes the investment in the wirework and posts to support a new hop yard, he is hoping that the investment will be good for at least 20 years. Growers are very dedicated, working hard to deliver the highest quality hops often against all the odds — like the weather — and in return they are seeking a partnership from their customers and brewers. That partnership needs to deliver sustainable returns and some sense of surety in the form of contracts for at least 3 years. One point on sustainability. 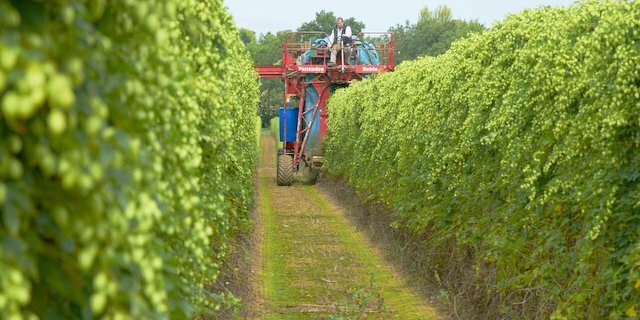 One of the most unique things about British hops is that very little of the total crop is irrigated, which makes them some of the most environmentally sustainable in the world. And to finish on the Stocks Farm philosophy: Listen hard to our customers, motivate our staff to produce the best quality hop crop possible, have fun with our brewer friends and operate an open door policy. Our craft brewing customers from anywhere in the world are welcome to visit any time of year to see what we do, and as it’s one of the most beautiful parts of the world, it’s definitely worth a visit.